With hot spots like Cantina and Shucks right across from campus, Mid-Town seems like the greatest place on Earth when you first get to the University of Florida. After a while though you can probably bet on who will be doing the Later Gator flip on your way home. When you’re ready to put the clubs to rest, check out some of these unique off-campus activities. When I first heard about Two Tails Ranch I knew I’d be mentioning it first. Founded in 1984, the ranch has seen over 200 elephants roam the growing 67 acres of land. 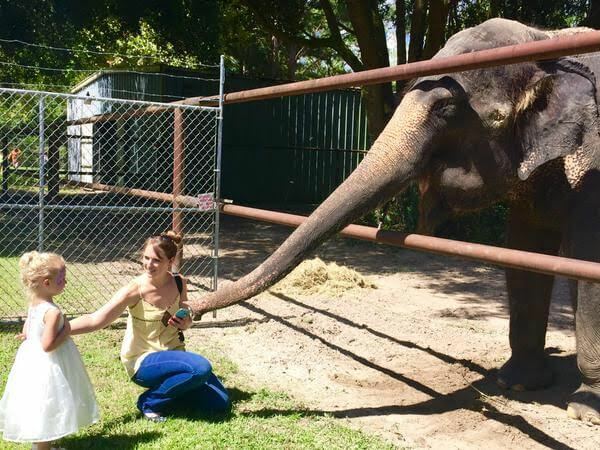 This one of a kind ranch includes guided tours and even interactions with elephants. But what are these grassland animals doing in the swamp? They’re brought to Gainesville for medical reasons, training or for temporary holding while their permanent homes are under construction. Hand feeding one of these gentle giants only costs $5.00, but the ultimate experience to riding one costs $40.00. On tours ($10.00 per child and $20.00 per adult) you also see zebras, tortoises and an ostrich. Because tour times are determined by season and the animals’ schedule, you have to call or email ahead. 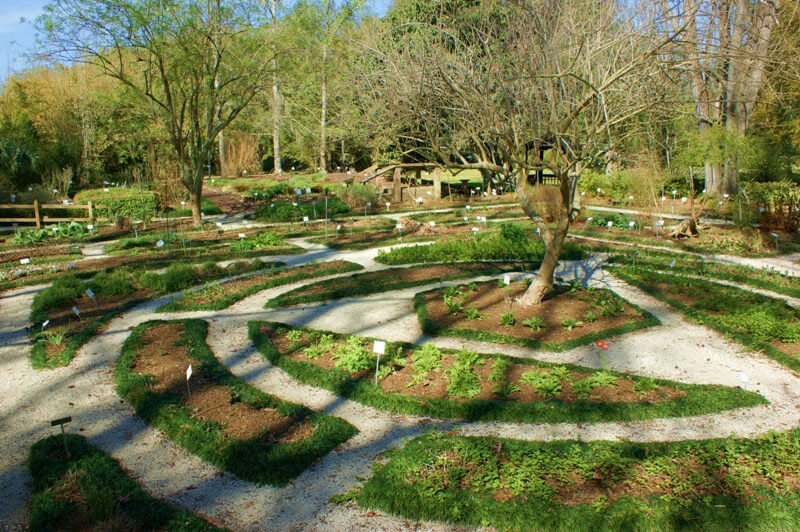 From the jungle to the garden, Kanapaha Botanical Gardens gives you a chance to relax and take your mind off stressful term papers and exams. For only $7.00, a 1.5-mile pathway allows you to walk through and see nature’s most beautiful sights. The Garden hosts guided tours on the first Saturday of every month starting at 10 a.m. as well as other special events during the year. On May 14, the garden hosts its Moonlight Walk, where the pathway is lit with lanterns, live music and telescopes from the Alachua Astronomy Club to see the stars. 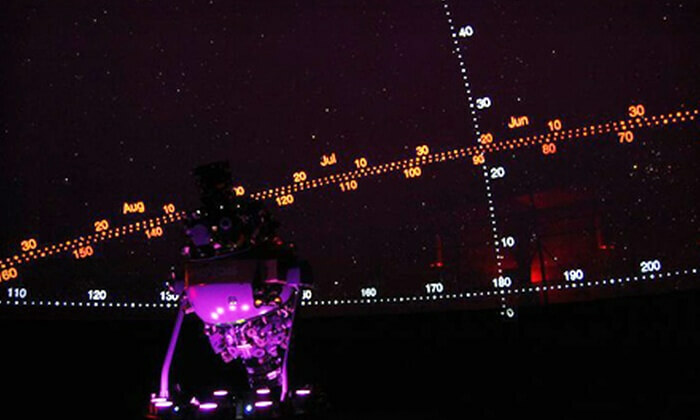 Want a rare way of viewing the stars? Stop by Santa Fe Kika Silva Pla Planetarium. You might think that you haven’t visited a planetarium since your fifth grade field trip, but this time you can see something out of this world (pun intended). On Fridays and Saturdays for $10.00, the planetarium shows Music 360 shows. These shows combine classic sounds of Pink Floyd, Led Zeppelin and U2 with a light performance to immerse all your senses in a way like no other. 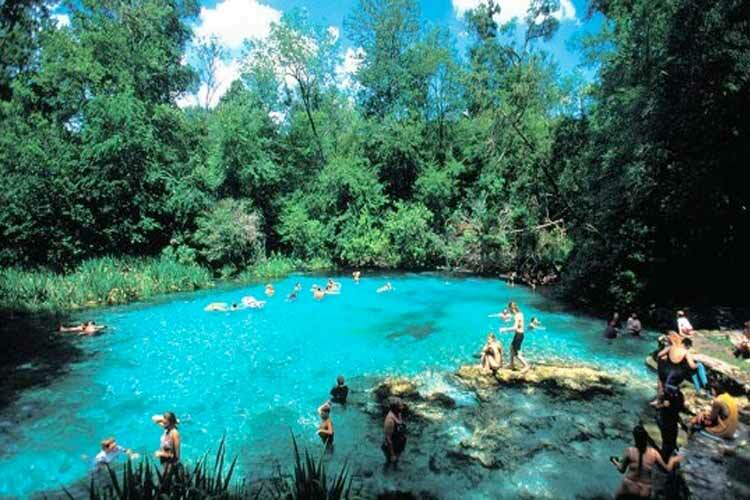 Once you get back down to earth, grab your swimsuit, a Bubba Cup and your closest friends and head down to Ginnie Springs. The springs are located on the Santa Fe River in High Springs. Admission is $13.09 and renting tubes is just $5.60–or you can save some cash and bring your own floats. Feeling adventurous? Rent a mask with snorkel for $5.00 to look through the clear waters and discover what lies twenty thousand leagues under the springs. The name might ring a bell as it’s probably one of the thousand things you forgot they told you about during Preview. So listen up this time, because you don’t want to spend your entire semester at Club West. Free with active Gator1 IDs, students and faculty can bring up to four guests for free. There are two sections to the Lake: North Park and South Shore. 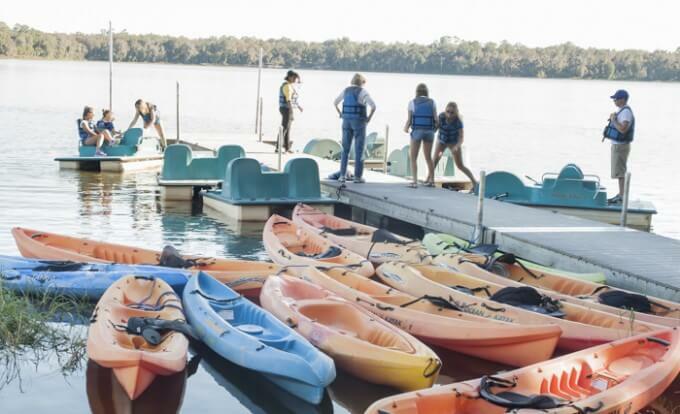 At North Park you can enjoy activities like paddle boarding and sailing, or you can relax on the sand and enjoy the cool waters. South Shore invites you with a rock wall, challenge course and disc golf—the perfect place to stir up a little competition between you and your friends. Basking in the Florida sun can be exhausting, so take a seat and enjoy a show at the Hippodrome. 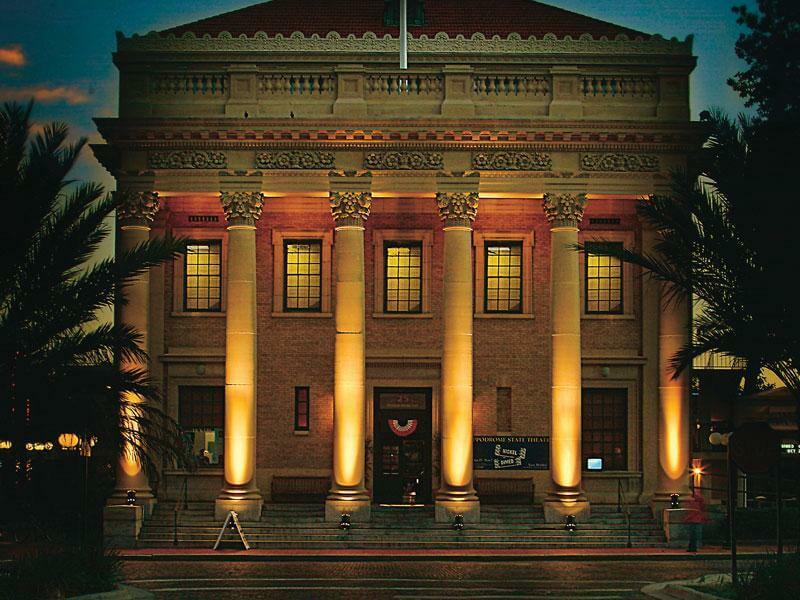 If you’ve ever strolled through downtown Gainesville, you might have walked past this beautiful building off Main Street without knowing what lies inside. The Hippodrome, or the Hipp as Gainesville natives call it, is the local theatre. Presenting live plays as well as screenings of independent films, the Hipp is a great spot for date night. You can catch one of a kind productions like All Girl Frankenstein or new adaptions of classic tales like A Christmas Carol. The best part is this elite art form offers student discounts on tickets as well. 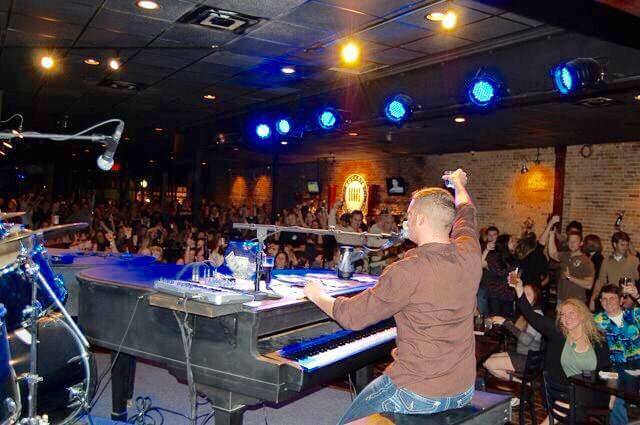 After the show, stick around downtown for another live performance at Rockey’s Dueling Piano Bar. Also on Main Street, Rockey’s offers two pianos across from each other so people can literally duel with the sound of music. From Tuesday-Saturday Rockey’s hosts a night that anyone 18 and up will enjoy. Need a creative outlet? Mellow Soul Tuesday is an open mic night where poets and musicians are invited to perform in front of live audiences. Looking for a good laugh? Comedy Boom Wednesday presents professional touring and local comedians. Always wanted to drink and sing along to piano versions of your favorite songs? Thursday is College Night. Ladies 21 and over drink free from 8 p.m. to 11 p.m.
Because you can never have too many creative channels, let your inner Van Gogh shine at Corks and Colors. 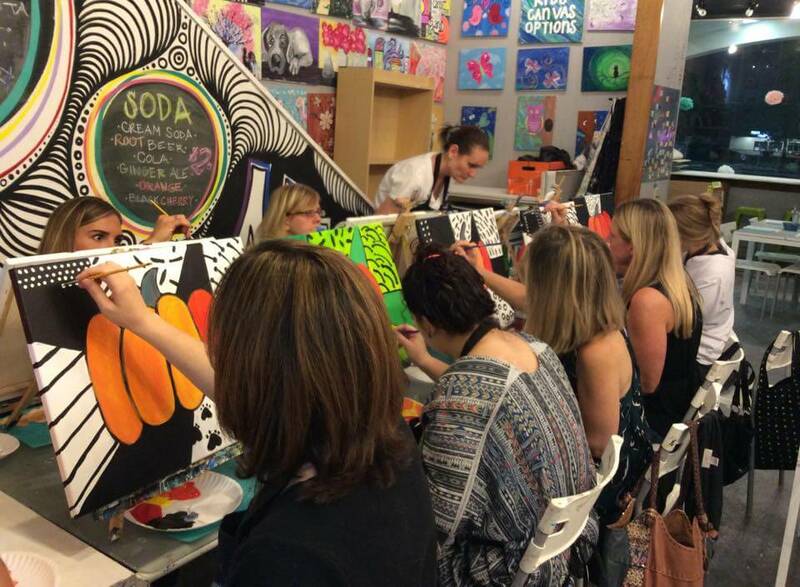 The art studio offers group classes where you and friends can drink wine and unwind (if you’re 21 of course). Each class offers a different picture to paint with step-by-step instructions led by a professional. Costs range from $20 to $45 depending on the size of the canvas. Check out the calendar for dates and times to sign up for the class you want or walk in during open studio hours to paint your own canvas for $20 or a pottery piece with prices starting at $8. Throwback to your 10th birthday party at your favorite hometown alley. Surrounded by French fries and good friends, nothing beats this blast from the past. 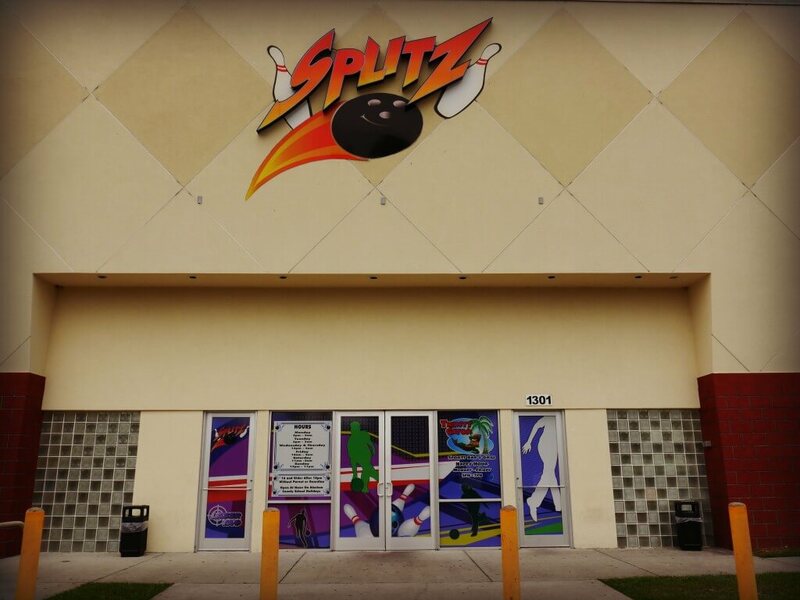 If you’re spending your birthday in G-Ville this year, take a moment to feel nostalgic at Splitz Bowling alley. Offering daily specials, like Ladies Nights on Thursdays where girls bowl free with a paid guy, you and your friends are sure to have a great time. This list wouldn’t be complete without mentioning a dinner option other than Gator Dining. 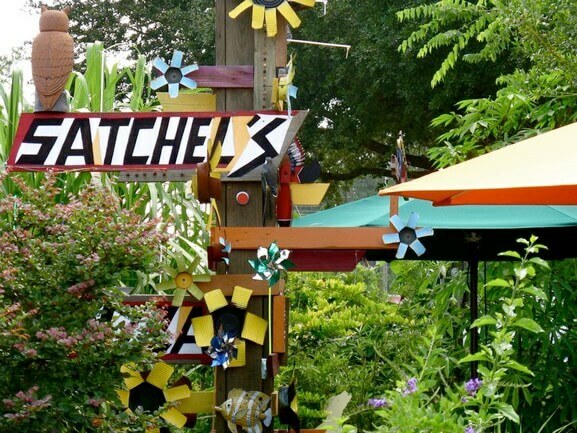 Satchel’s Pizza continues to be one of the most unique pizza shops in Florida since its opening in 2003. The restaurant features two small catches though: It’s cash only and the convenient ATMs charges a $1.50 fee. This fee isn’t for Satchel’s to make a profit though; the earnings go towards the Satch Capital Fund. This “Satch Cash” is donated to projects and charities in the community. Of course, the best part of Satchel’s is the mouthwatering pizza. With over 30 toppings to choose from, two dairy free cheese options and homemade cane sugar sodas (with free refills), even the pickiest can be satisfied.